I want to start by saying how honored I am to be giving this, the first Bob Fitch memorial lecture. I dearly hope there will be a second and many more after that, and it’s up to some of us in this room to make that happen. I admired Bob tremendously. I can’t think of anyone I’ve known personally who’s influenced me as much. He was remarkably erudite—read deeply in many areas and wonderfully cultured in an almost old-fashioned way. I called him once when he was listening to Schubert. We got to talking about the greatness of much bourgeois culture, and he criticized today’s bourgeoisie for taking such poor care of its class inheritance. That task had fallen to Marxists, I guess. He was also a warm, generous, and very funny guy. It breaks my heart that I’d lost touch with him in recent years. I’d been resolving to change that, but then it got too late. I never got to talk to him about Bloomberg or Obama. I’m ashamed, actually. I met Bob in the late 1980s—I can’t remember exactly when. He was just resurfacing after several years underground. A major publisher had given him a big advance to write a book about New York City, and he found it impossible to deliver. Bob delisted his phone number, gave up writing for union organizing, and tried to keep the forces of the bourgeois system at bay. When the coast cleared, he started writing for the Village Voice. His editor there, and mine, Don Guttenplan, introduced me to him. On Don’s recommendation, I’d just read Bob’s fantastic 1976 essay “Planning New York,” which was adapted for The Assassination of New York 20 years later. It was about the 1929 plan for New York City drawn up by the Regional Plan Association. It laid out the outline for an auto-centered metropolitan region, including the highway system that would later be attributed to Robert Moses. It developed and formalized an old upper class desire to deindustrialize the urban center. The essay made it impressively clear just how precisely planned by elites over the very long term the physical and social evolution of New York City has been. One’s casual impression of the city may be that it’s unplanned and chaotic, but it’s long been anything but that. It’s been guided by the careful hand of the FIRE sector—finance, insurance, real estate—and the elite nonprofits and experts that think for it. Bob and I became good friends after I read the essay. We saw each other from time to time but a lot of our friendship was on the phone, many hours a week. 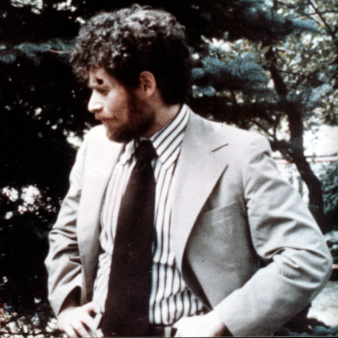 Bob talked to me a lot about the ideas that led to The Assassination of New York. I’d been living in the city for about ten years when I met Bob, and until then I never really understood how the place works. I had only the vaguest idea of how people like Felix Rohatyn and firms like his Lazard Frères shaped the city—including shaping the LaGuardia campus where we are right now. Another is the state of the labor movement. When I was first asked for a title for this talk, I thought of something like, “The labor movement survived Bob Fitch, but barely.” The spectacle of Trumka endorsing Obama, months before he really had to, reminded you that institutions, like economic stats, can come in under expectations, even when expectations are already low. Back in 1995, when many on the labor left were excited over the ascension of John Sweeney to leadership of the AFL-CIO, Bob dismissed it as delusional. (I’d forgotten until just now that among the 11 union presidents who gathered to push Lane Kirkland aside was Arthur Coia, the leader of the Laborers Union who was driven out for corruption and criminal ties.) Later, when the labor left got all giddy over Andy Stern, Bob stabbed holes in those illusions too. And then there are the Democrats, in whom organized labor is incorporated in a vassal-like relation. Though a lot of liberals moaned some about Obama last year, this year re-electing him is a task of world-historical proportions. Personally, I’d like to see Obama re-elected because it’s better for radicals when Dems are in power; it makes it clear how the suckiness is systemic, and not a matter of personnel or party. But that’s not the prevailing view. The urgency to support the Dems, as it often is, is driven by the awfulness of the right. If Romney wins, the Tea Party will move into the Executive Office Building. Can the brownshirts be far behind? I recently came across the text of a talk that Bob gave to the Harlem Tenants Council, ten days after Obama was elected. After acknowledging his considerable talents and powers of enchantment, and the pride that African Americans felt over his election, Bob wondered just what was his political philosophy and just what interests did he represent? His political philosophy, said Bob, was Third Way-ish and communitarian, meaning that he dismissed any idea that there are real conflicts in society because we can all just reason together and do what’s best for all of us. But by saying that, they’re really just siding with the powers that be, because there are real conflicts in society and there can be no Best for Everyone happy ending. Following that is a dazzling analysis of Obama’s roots in Chicago society—one of those Fitchian moments in which the world makes a lot more sense after you’ve gone through it. Many of us are familiar with the way that Obama was groomed for excellence by power from his early days. Beloved of elite schools and foundations, Obama—who’s poked fun at his mother’s “position-paper liberalism”—had a charmed rise on the status ladder of American society. When he arrived at the Senate, after not all that much experience in the Illinois legislature, he would have none of the gladhanding necessary to get along in that dismal body. So Harry Reid called him in after about a year and a half and told him that he had no aptitude for the Senate and he should run for president instead. Reid & Co were terrified that Hillary Clinton would get the nomination and lose disastrously, so Obama was their hope. Yet they were so afraid of Hillary’s vengefulness that they promoted his candidacy secretly at first. (The story is told in John Heilemann and Mark Halperin’s Game Change.) Obama proved himself up to the challenge. But that this guy was any kind of outsider, that he was anything but wired to the center of the Democratic branch of the power structure, well, it was remarkable what people believed in 2007 and 2008. But Bob’s great contribution was to trace Obama’s roots in Chicago property relations. Over the last two decades, he reported, there’s been a concerted plan to gentrify the South Side of the city, home to the largest black population in the country, many of them rather poor. (Among the country’s ten-biggest cities, Chicago has the third-highest poverty rate, and the highest black poverty rate.) In the 1950s, the policy was urban renewal, meaning razing low-rise housing and moving black Chicagoans en masse into high-rise public housing. It did not work well. So in the 1990s, Democratic urban planners decided it was time to “spatially deconcentrate”—meaning knock down the high-rises and move people back into dispersed private housing. This was touted as an anti-poverty measure: since poverty is considered to be a communicable disease, scattering the poor about town will reduce their exposure to each other, thereby reducing the spread of the illness. In Chicago, Daley’s administration cleverly brought black developers into the heart of the scheme. They would build and rehab the new units the displaced poor would move into. Since much of this happened in Obama’s state senate district, he knew the principal players very well. As Bob put it, there was a constellation of interests around Obama in Chicago—the typical FIRE sector, personified by big Chicago families like the Pritzkers and the Crowns, but also what Bob called “friendly FIRE,” the liberal foundations and nonprofit developers who try to synthesize an aura of community uplift around gentrification. A lot of what is called community organizing in this country quickly devolves into high-minded real estate development, typically with the assistance of the Ford Foundation—which by a not very stunning coincidence, employed Obama’s mother in Indonesia. It doesn’t take anything away from Bob’s genius to say that these are not the kinds of facts that you need to spend years in obscure archives or filing a ream of freedom of information act requests to discover. (He did lots of that over the years, too, but not for this talk.) Most of the secrets of American political life are, like Poe’s purloined letter, hidden in plain sight. It’s just that many people don’t want to think about them. Certainly not all those people suffering from Obamamania in 2008, when Bob gave that talk, or even the mildly disillusioned liberals of 2010—and certainly not all those enthusiasts suffering from a relapse of their 2008 enchantment in 2012. Years divisible by 4 produce such predictable delusions. I’d like to spend some time with “Planning New York,” my introduction to Bob Fitch’s work. It was incorporated into The Assassination of New York but I still like the old version for sentimental reasons. It appeared in a collection, The Fiscal Crisis of American Cities, mostly though not entirely about New York, that was edited by Roger Alcaly and David Mermelstein. Alcaly, by the way, left radical economics to run a hedge fund, and then wrote cheerful articles about the New Economy of the late 1990s for The New York Review of Books. Bob’s piece was about the Regional Plan Association’s 1929 plan for New York. The RPA is a classic elite outfit—a FIRE-dominated think tank, founded in 1922, which according to its own ad copy is all about improving the quality of life in the metropolitan area. Its idea of quality of life becomes quickly apparent on the front page of its website, which just the other day featured a study on how to make large real estate projects, which contribute so much to that quality of life, work. The RPA’s board consists of developers and financiers—including one guy who runs a hedge fund called Dialectic Capital Management. You have to wonder what his personal history is—but whatever, it got him a $5 million house in Brooklyn Heights. New York has a habit of producing these long-term plans right around stock market peaks. There was another in 1968, just as the rot of the 1970s was to set in; another in 1987, just before the stock market crash; and another in 2007, just as the Great Recession was about to hit. That’s good for a chuckle—the bourgeoisie can be so silly—but still, the plans do basically come true. The local FIRE elite is capable of thinking beyond the business cycle—more than their national counterparts, it seems. When your fortune is tied to real estate, you can’t easily up and leave; you’re forced to care about the long term. One reason for the appearance of grand plans at major market tops might be that during the boom that precedes them, FIRE accumulates vast wealth and power that they can then translate into long-term political gains. As Bob pointed out, the financial and real estate boom of the 1920s allowed FIRE to rise to local dominance, and though much of that wealth evaporated in the crash, the long-term plans remained intact. Similar things could be said about the later iterations. In The Assassination of New York, much of it written during the early 90s slump after the ’87 crash, Bob was skeptical that the grandiose plans could be fulfilled. But there were two more booms to come—the stock mania of the late 1990s and the housing bubble of the mid-2000s, both of which fattened Wall Street and allowed for more office buildings and fresh frontiers of gentrification (though it didn’t hurt that 9/11 took 12 million square feet of office space off the market, depressing the vacancy rate as the economy was about to recover from the 2001 recession). Again, it’s amazing how much of this scheming is hidden in the open. But it provokes no interest from mainstream journalists. I once talked with a New York Times reporter who’d been freshly posted to the metro desk. She was wondering what to write about. I suggested land use stuff—how apparently random real estate deals actually fit in with these long-term schemes. She wondered what the news value of this is. I said, the city is carefully planned and no one ever talks about that. (I had my doubts that the Times would ever publish such stories, but still I thought it was worth a try.) She found it completely uninteresting—there would only be a story if “some politician is getting rich off it.” Of course that’s been known to happen, but that’s not the most important thing. How a small elite shapes the economic, social, and physical environment we live in strikes me as a very important story, but it has no news value to a mainstream journalist. As Bob put it, the influence of the 1929 plan can be seen in the division of the region into Slab City—the high-rises of Manhattan—and Spread City, the suburbs that surround the city center. This was enabled by the building of a set of highways that made it possible to travel to and from the city, or comfortably around it if you were traveling elsewhere. The network of highways typically attributed to Robert Moses were actually laid out in the RPA plan: as Bob put it, all Moses had to do was pour concrete on the dotted line. The central idea was to concentrate high-end activities in the city center—finance and other service businesses that could afford high rents—and move the noxious stuff out to Jersey. Bankers with a taste for the country life would find it easier to get back and forth from Long Island or Westchester, and those that liked the urban life wouldn’t have to compete with the working class for housing and retail, or have to look at them on the sidewalk. As Bob argued, Slab City requires high levels of public spending on physical infrastructure. This need is at the basis of a lot of Democratic politics—developers (and their bankers) contribute to politicians who then reward them with appropriate projects. It’s amazing how pervasive this relationship is over time, whether it was Harry Truman and his Kansas City patron, political boss Tom Pendergast, who just happened to own a cement plant, or Obama’s relationship with his Chicago patrons. Truman, though, was old-style, the product of an urban machine. Much preferred by the FIRE elite are cap-P Progressive or cap-R Reform politicians, technocrats who are supposedly above the petty corruption of Tammany-style politics. As Bob put it, the major difference between those two tendencies can be seen most clearly in the municipal budget: Tammany types stoke the expense budget with patronage schemes, but the Reform types love the capital budget, with its infrastructure schemes. In fact, Bob argued that it was the borrowing to fund capital spending on transit and middle-income housing that got New York City into debt trouble in the 1970s, not the alleged generosity of the social services budget, as mainstream hacks like to claim. Back to the ’29 plan. It was passionately devoted to getting manufacturing out of Manhattan. Though garment makers liked to be close to retailers, real estate interests didn’t like that. Rag shops took up space that could be far more profitably rented to bankers, lawyers, and admen. Too many garment workers—many of them unpleasantly Jewish—were clogging the sidewalks and scaring the wives of the better sorts away from high-end shops. Instead, the city should be reconfigured in line with this rough hierarchy: 1) financial business, 2) fancy retail, 3) fancy residential, 4) inferior retail, 5) wholesalers, and, at the bottom of the list, 6) industry and working-class housing. The ultimate goal was to turn the city into one of the commandingest peaks at the commanding heights of global economic activity: finance, senior management, and the consciousness industry. Of course, the poor would not go away, even if their housing was demolished in the name of urban renewal and slum clearance. Instead, they’d be rendered structurally unemployed as industry was driven out to the suburbs or beyond. White flight, deindustrialization, and all the other familiar phenomena of post-World War II America didn’t just happened. The RPA et al. made it happen. These themes are developed further, into the Dinkins years, in The Assassination of New York. But it’s amazing how much of the long-term urban strategy was established in the 1929 plan and continued even into the present. The planners did face a challenge in recovering from the trend that culminated in the crisis of the 1970s: there had been too much decentralization. It was essential to do some recentering—to get more high-end service activity in Manhattan and more rich people living there. It worked. And as Manhattan upscaled, so too did Brooklyn. But that, too, was no accident. Starting in the late 1960s, with the able assistance of Pratt Institute—named after its founder, Charles Pratt, a great property owner and Rockefeller partner—city planners pushed industry out of Brooklyn and began the gentrification of working-class neighborhoods. (I live in a former shoe factory at the eastern edge of Clinton Hill, just blocks from Pratt, that was turned into condos in 2005.) More recently, the Atlantic Yards project—heavily supported by city funds and with the massive power of eminent domain (New York has the most developer-friendly eminent domain laws in the U.S.)—are a perfect example of the use of public infrastructure projects as a gentrification strategy. The scheme extended the strategy of turning downtown Brooklyn into an office park and surrounding neighborhoods into elite residential space. You can read the outlines of more recent planning in the 1987 volume, New York Ascendant: The Report of the Commission on the Year 2000, led by Robert “Bobby” Wagner, Jr., son of the three-term mayor. The report projected that city employment in 2000 would approach 3.8 million, matching the late-1960s peak, about 300,000 above where it was when it was published. But the stock market crash, and the bust that followed it, actually knocked nearly that much off city employment, leading Bob, writing in the early 1990s, to be very skeptical of the Wagner commission’s ambitions. This is a further reminder that radicals should always be careful of underestimating capital’s powers of self-renewal—something we should do even today, when it looks like the whole system has busted a gasket. As it turned out, the Commission was right on target. 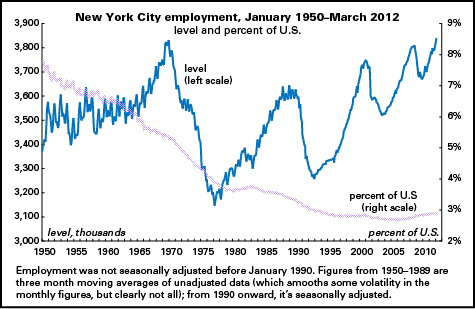 City employment peaked at 3.8 million in December 2000, coming within a hair of the 1969 peak. (The city’s population was about 300,000 lower in 1969 than it was in 2000, meaning that a smaller share of the population was working. That’s structural unemployment for you.) And, by the way, we matched that level again in 2008, and are now above it after having lost fewer than 200,000 jobs in the Great Recession. FIRE’s recovery from the 2008 crisis has been very impressive, even if the recovery of the economy and the debtor class has been a lot less so. And what was the development strategy outlined in New York Ascendant? Surprise, surprise: being a world capital of what economists call the tertiary sector. The primary sector is basic stuff like farming and mining; the secondary, manufacturing and construction; and the tertiary, elite services like finance, lawyering, and advertising, and less elite services like retail and restaurants. There’s more money to be had in the elite services, but bankers do like to eat well and wear snazzy clothes, and their kids do need nannies, so the tertiary city is notorious for a barbell-shaped income distribution: a legion of low-paid service workers tending to the high-paid service workers but with not so many people in the middle. This is, as the vulgar Marxists used to say, no accident. And, as Bob Fitch liked to say, vulgar Marxism explains 90% of what goes on in the world. New York Ascendant did allow for a smallish manufacturing sector—a specialized one, tied to dominant industries, like “very high-end fashion,” serving the local design talent, and costume making for the theater. It also sought to retain low-end clerical work for the finance sector and to encourage the development of the information sector. To retain the back office stuff would require the extension of the central business district (CBD) across the East River into new beachheads in downtown Brooklyn and Long Island City. That has happened. That’s why we have MetroTech in downtown Brooklyn, populated among others by Chase (the old Rockefeller family bank) and NYU. And it’s not just the extension of the CBD: we see the Bloomberg administration pushing a high-tech campus on Roosevelt Island and pressing the residential development of Hunters Point just south of Long Island City, squeezing out the industrial uses that used to dominate the neighborhood. And that scheme also explains how the campus we’re on now, LaGuardia College, evolved—though that was not the planners’ original intention. In accordance with elite scheming, Lazard Realty, an arm of the investment bank that employed the mighty Felix Rohatyn for many years, developed several buildings along Thomson Ave. in the late 1980s, with the hope of filling them with clerical workers. Rohatyn, while often portrayed as the “savior” of New York City, was the leader of the bankers’ coup during the fiscal crisis of the mid-1970s. He and his comrades displaced the elected government and imposed what could only be described as the dress rehearsal for the neoliberal agenda that would transform the world from the 1980s onward: austerity for the masses and largesse for the overprivileged. Of particular interest to CUNY people was Rohatyn’s insistence that the policy of free tuition, first established by municipal referendum in 1847, come to end—not so much for its fiscal importance, he said, but for its shock value. No more something for nothing in the era of lowered expectations. Lazard Realty’s plans for the stretch of this road that it called Thompson Place proved ill-timed. The buildings were ready for occupancy just as the stock market crashed and the 1980s boom was turning to bust. But CUNY came to Lazard’s rescue, as LaGuardia College bought one of the buildings in 1988. No shock value, no lowered expectations for Lazard! And another building was filled by the School Construction Authority, created by the New York State legislature in, yes, 1988. And, curiously, one of the prime advocates for the creation of the School Construction Authority—an independent authority to handle building and renovation tasks formerly handled by the Board of Education—was none other than Felix Rohatyn. Construction is a bondable activity, and investment bankers love floating bonds. But, as Bob frequently underscored, elites love the capital budget far more than the expense budget. Creating the SCA was just right for Felix’s personal and professional interests. And the timing was just right to take a problem property off Lazard’s hands. I found all that out back in the early 1990s, when I was writing about the political economy of New York for the Village Voice—very much under Bob’s tutelage. I really miss doing that. I’ve lost track of what’s going on, and I can’t think of many prominent outlets for that sort of investigation. I’d really love to know what to make of Bloomberg’s plan for the year 2030, which includes more of the same, of course, with an emphasis on a green agenda. I love bike lanes, alternative energy, greenhouse gas reduction, and restrictions on auto use as much as any other red–green hybrid, but Bob taught me to be skeptical of this sort of thing, because it typically had a real-estate angle. Elites have loved parks because they take land off the market, thereby boosting the value of the remainder, and because they create hypervaluable parkside locations. But we love parks too. And we do want to save the earth, and short of a revolution that seems not to be imminent, we need enlightened bourgeois politicians to embrace a green agenda. I wish Bob were here to help us think straight about this era in which the richest man in town, a titan of the FIRE sector and not its mere servant, is in his third term as mayor. 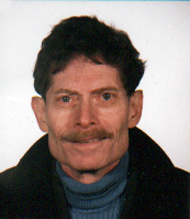 Bob’s death severely reduces the ranks of people who study the political economy of New York City seriously. It also reduced the ranks of those who want to do something better with the substantial resources we have here. It was brought home to me how few of us there are about 20 years ago, during the Dinkins years, when we tried to put together a little think tank to come up with some alternative redevelopment schemes, centering around rebuilding the port and restoring the rail link to the mainland, both of which would encourage the development of manufacturing (and, incidentally, clean the air considerably, since almost everything that comes into town has to come by truck—something like 90% of it over the George Washington Bridge). We managed to put together a handful of people, but there was no interest from the unions. To them, Bob was radioactive, as was the agenda. (Here’s a measure of how radioactive. Bob thanked a union staffer in a footnote to an article he’d written for an obscure journal. When the journal came out, the staffer called him, livid and terrified for being publicly associated with him. He feared reprisals from his bosses.) Nor was there any interest from some of the better politicians. Ruth Messinger, then the borough president of Manhattan and publicly identified as a member of Democratic Socialists of America, let it be known that not only did she want nothing to do with the group or its agenda, she didn’t want us talking about how low the wages were for a good bit of the city’s workforce. Without support, the people’s think tank, our RPA for the masses, quickly evaporated. The chilly reaction of the unions, aside from CWA Local 1180, which gave us meeting space, was a reminder of one of Bob’s more profound observations: on major political questions, unions take their cue from their employers. Obvious after you hear it, but not before. We saw that most consequentially in the hostility of Andy Stern’s SEIU to a single-payer health care system, which he scornfully dismissed as a Canadian import. Of course, the employers of SEIU labor, the hospitals and nursing homes with whom he’d made so many noxious secret deals, didn’t want a single-payer system. And so, rather than traffic in Canadian imports, Stern chose instead to make common cause on the issue with Wal-Mart CEO Lee Scott. Ah, the unions. Bob’s work on New York City alienated the liberal politicians, whose complicity with the FIRE sector threatened their claims to high-mindedness, and the elite foundations, who bankroll so many high-minded intellectuals. Many otherwise decent people need grants from Ford and Rockefeller and are scared to death to say anything about how philanthropists constrain political discourse. Many formerly decent people fall under the philanthropists’ sway and think they’re fighting for justice when they’re really engaging in upper-class charity work that ultimately sustains rather than challenges the social hierarchy. Bob’s relentless criticisms of the labor movement, for being made up of corrupt and ossified feudal structures, made him very few friends. He went too far even for some on the left wing of the labor movement, who just didn’t want to hear what he had to say. It might be ok to criticize labor for having lost its fighting spirit to bureaucratization, but as Bob liked to say, it’s wrong to call the labor movement bureaucratized, because bureaucracies are effective. The rot was much deeper, and more structural. Few things annoyed progressive union types as much as Bob’s critique of Andy Stern’s SEIU. As Bob pointed out, much of the growth in SEIU’s ranks came from very questionable sources. One was home care workers, who got union recognition in California and Illinois. This was accomplished by large contributions to gubernatorial campaigns (including that of the notorious Rod Blagojevich, now federal prisoner number 40892-424); the victorious governors said thank you by granting SEIU recognition to represent them. Many of these home care workers are people who are reimbursed for their efforts in taking care of sick relatives. This sort of union growth has nothing to do with organizing against the will of hostile employers. And SEIU did little or nothing to raise their dismal rates of pay. For pointing this out, Bob was accused of devaluing the home care workers, when instead he was showing how meaningless Stern’s claims of vigorous growth were. And then there were the sweetheart deals with nursing home operators, in which SEIU was granted the right of representing workers at some homes in return for ceasing organizing efforts at others—and for agreeing to lobby on behalf of the operators’ political agenda, which included defeating a bill of rights for nursing home residents, and forbidding workers to agitate on behalf of the residents. That boosted the membership rolls, but gains to the working class are hard to measure. Intellectuals loved Stern, because he was an Ivy League guy who talked like them and cultivated them. It didn’t hurt that he wrote checks to support their journals and websites, either. And so Bob’s critiques were dismissed with great scorn. I’d like to say that Bob was vindicated when Stern retired, his union aflame in civil war and something like $100 million in debt, but I’m afraid few opinion shapers see it that way. Bob wasn’t perfect, dare I say? But some of his vices were inseparable from his virtues. He sometimes leapt to conclusions—but he was usually right, but it always gave the nitpickers some nits to pick. He was interested in a million things—early on, he wrote a book about Ghana. He’d studied Chinese. That breadth of interest sometimes devolved into an undisciplined lack of focus. He started many things he never finished. Marty Gottlieb, the former editor of the Village Voice now at the New York Times (and who, despite that career trajectory is a very fine man) who helped him write Solidarity for Sale, told me that Bob was very difficult to work with—too often all over the place. But that’s part of what made him so great and lovable. His mind never stopped working, at an almost sublime level of ambition. I was writing about New York politics and power at the time, and thinking I was doing a pretty good job of it; then I read The Assassination of New York, which just made me feel embarrassed and even humiliated about all the things I hadn’t known. I learned so much from that book—and from and from my many memorable conversations with its brilliant, gentle, intense, and utterly incorruptible author. [It’s a] scandal that they scrape the barrel to give these so-called genius grants to third-rate conventional fakers when Bob Fitch, a man who did his own thinking and his own research, and who came up with truly original insights about some pretty important topics—urban planning, organized labor, critical journalism—had to live like a luftmensch. Alexander Cockburn once said the mission of the bourgeois pundit is “to fire volley after volley of cliché into the densely packed prejudices of his readers.” Left media often do the same, whether it’s lionizing Andy Stern or cataloging the terrors of the Tea Party (which of course make it essential that we get all fired up for the current Democrat). Bob would have none of that. Though he had an excellent circle of passionately devoted friends and fans, he alienated a lot of people who could have made his life materially easier. But as Mike Tomasky said, he was utterly incorruptible. I have a six-year-old son who gets upset when people believe in fictions. He’s not against fiction as fiction—his problem arises when people actually believe stories of their own creation. He wouldn’t agree with Wallace Stevens that “The final belief is to believe in a fiction, which you know to be a fiction, there being nothing else.” So when kids talk about the Tooth Fairy, he indignantly tells them there’s no such thing. The same with Santa Claus. He seems pretty sound on the God question, too. I think he might have inherited this some from me. I want to tell him it won’t make you popular, but I stop myself, because we need all the people like that we can get. Assassination of NY remains one of the best books ever written about NYC. Thanks for this talk/essay about Fitch, whom I’ve long admired. I regret that once, when I worked for the Campaign Finance Board, I didn’t tell him so, as he was researching sources of some of the contributions that make the pols go ’round. What a tour de force in class analysis. Cheers Doug! Comrade Fitch sounds a fine fellow worker. He’ll be missed. You keep on keepin’ on. I’m sharing this on FB. Wonderfully insightful homage to a terribly unsung intellectual hero. Thanks, Mr. H.
I went to high school with Bob. We both played left guard on the football team –took turns running plays from the coach to the quarterback. I never realized how brilliant he was until at our 45th reunion another classmate read aloud a letter he had written her in high school which she had saved. I then “found” him and encouraged him to come to the 50th, and saw him a few years later on a visit to NYC. What a man! What a loss!